Directorate of Health Service. 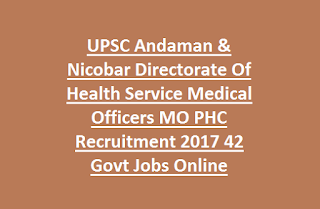 There are total 42 jobs of Medical Officers vacancies available in Directorate of Health Service Andaman and Nicobar Islands. These Medical Officers MO posts are regular basis. These PHC Medical Officers vacancies are Group A Gazetted, Non Ministerial. Selected Candidates have to work in Andaman Nicobar Administration area only. Willing candidates can apply online @UPSC recruitment website of www.upsconline.nic.in for A & N DHS MO Jobs. Last date for submission of application form online is 02-March-2017. This Medical Officers recruitment of UPSC Andaman & Nicobar will be held through personal interview and merit in qualifying examinations. 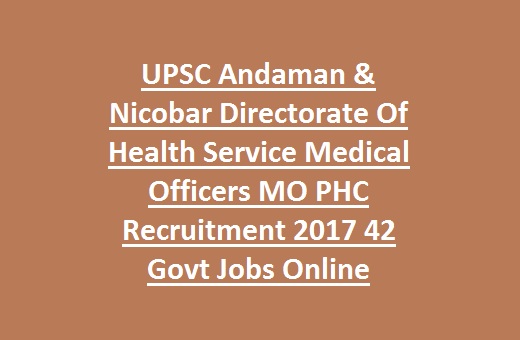 Number of vacancies category wise, pay scale, age criteria and reservation, educational qualifications details, and how to apply online details for UPSC Medical Officers Jobs MO recruitment 2017 is given below. Click here to see the official notice of UPSC Medical Officers Jobs Recruitment. Candidate must have studied MBBS and should have completed the Compulsory rotating internship. Upper age limit is 30 years. For reserved candidates age relaxations are applicable as per government norms. Selection for this UPSC Medical Officers recruitment will be held based on mark secured in educational qualifications and personal interview. Application fee is Rs.25 for General/OBC candidates and no application fee for Women and reserved category candidates. Click here to apply online for the UPSC Medical Officers Jobs Recruitment 2017. Please share this UPSC Medical Officers Recruitment 2017 article to your friends.